Fighters from the US-backed (at least for now) Manbij Military Council at the al-Arimah front southwest of Manbij town where they face Russian-backed regime forces. 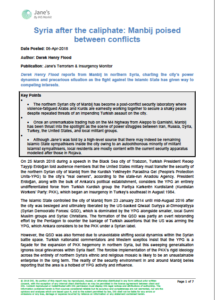 Manbij-I have a new piece out for Jane’s Terrorism and Security Monitor (subscription required) regarding the ongoing strategic deadlock over this modest city in northern Syria’s Aleppo governorate. Manbij has been in the news as of late as the Turkish government has repeatedly threatened to invade it unless its American NATO partners/foes enforce Ankara’s bidding to have the YPG retreat east of the Euphrates. There’s one problem with this AKP logic: the YPG does not control or administer Manbij. 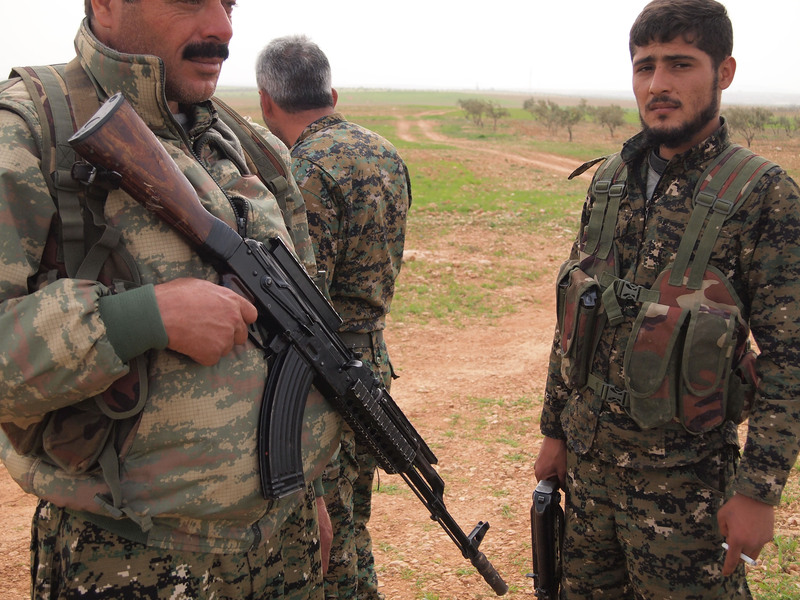 Manbij is secured by the Manbij Military Council, a constituent force of the SDF in which the YPG and YPJ are fellow constituents that are theoretically, if no way in practice, equal armed components in the SDF’s egalitarian outline. Politically it is run by the Manbij Civil Council which, although operating under the Democratic Federation of Northern Syria’s TEV-DEM norms, is not simply a PYD outpost under a different name. The local administration does not count itself part of Rojava and many council members speak zero Kurdish. Turkish claims are ultimately expressions of vague bellicosity. When that country’s president and his foreign minister reference Manbij, these statements have no bearing on ground realities in this mostly Arab urban centre. Manbij’s Asayish gendarmerie is almost entirely Arab for example. What the AKP bigs may have been conflating however was that during the battle for olive-rich Afrin (if I’m to give them the benefit of the doubt), the YPG and YPJ were transiting via Manbij on what seemed to be like a nightly basis both to and fro embattled Afrin. So in that sense, yes, the Turkish leadership was correct that was a YPG presence there but the key nuance is that it was on the move to defend the PYD’s northwestern enclave from the Turkish military and the ‘Free Syrian Army’ (rebranded salafi-jihadis mostly). The people of Manbij who were not able to flee north to Turkey and perhaps onward to the EU during the two year and seven month rule of IS there suffered immensely. After a siege in the spring and summer of 2016 in which the city was ultimately liberated, the place has been making a vibrant, remarkable comeback with seemingly no outside help unless you count Aleppan financiers as outsiders. 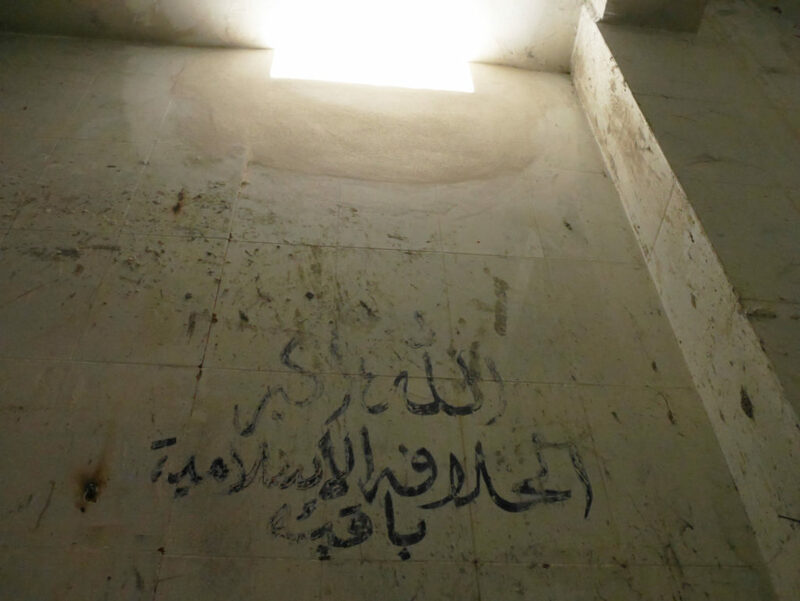 Exploring the remnants of IS’s brutality there was utterly haunting. Some of the torture techniques that were described to me seemed as if they were straight out of a CIA playbook circa 2002. Today, this town is thriving on the relative stability and freedom it provides IDPs, returnees, and those who never left, even as it faces a multitude of emerging threats with IS seemingly least among them.